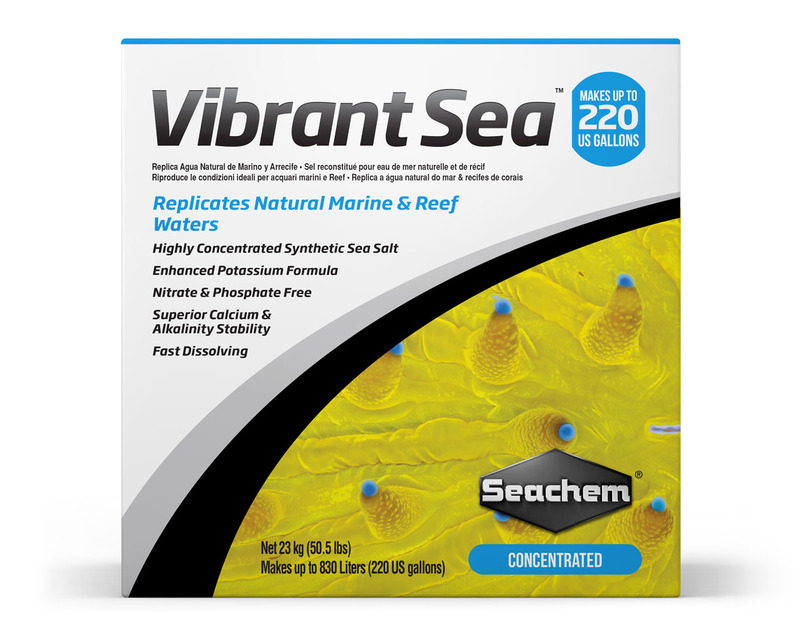 Mix Vibrant Sea™ with dechlorinated tap or purified water. We recommend the use of a commercial dechlorinator like Prime® to neutralize any tap water chlorine and/or chloramines. 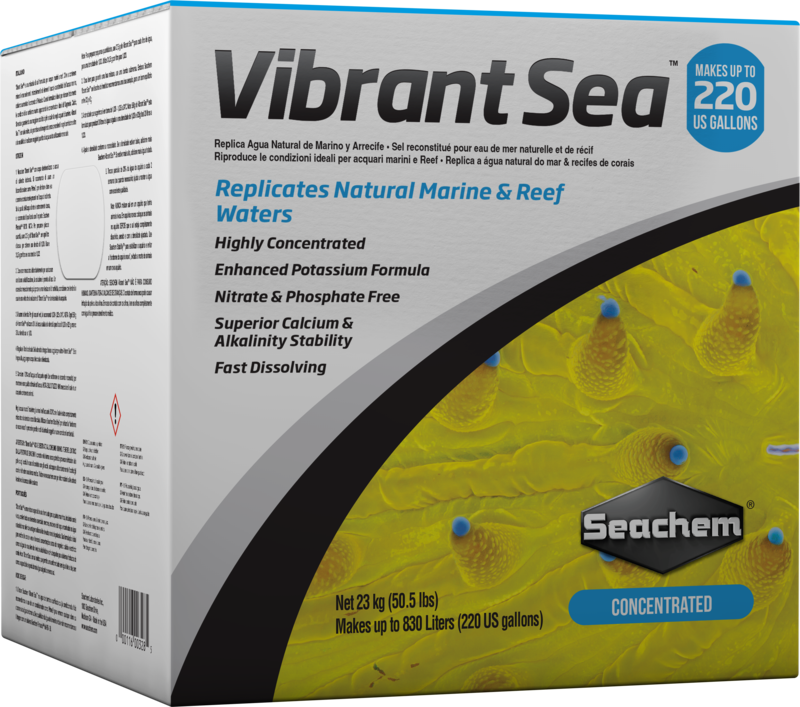 If source water quality is extremely poor we recommend purification with a Seachem Pinnacle™ RO/DI system. NOTE: To prepare small quantities, add 27 g of Vibrant Sea™ per 1 liter of water for a specific gravity of 1.020. Add 31 g per 1 liter for 1.023. For larger quantities, use 1/2 cup per 6 L (1.58 US gallons) for a specific gravity of 1.020 or 1/2 cup per 5.25 L (1.38 US gallons) for 1.023. Vibrant Sea™ is then ready for immediate use. Excessive mixing may result in cloudiness. Cloudiness will dissipate when the Vibrant Sea™ solution is added to the aquarium. For reef aquariums, 1.020 – 1.025 at 24°C (75°F) is recommended. 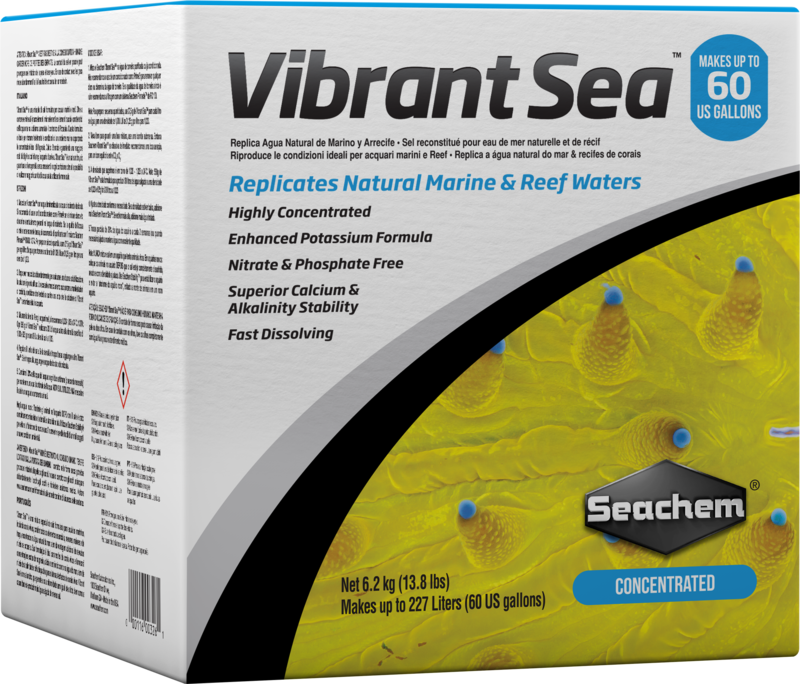 NOTE: 540 g of Vibrant Sea™ is formulated to create 20 liters of saltwater at a specific gravity of 1.020 and 620 g will create 20 liters at 1.023. If specific gravity is too low, add more Vibrant Sea™. If too high, add more dechlorinated or purified water. CAUTION: Vibrant Sea™ IS NOT FOR HUMAN CONSUMPTION. KEEP OUT OF REACH OF CHILDREN. Contact in dry form may cause skin or eye irritation. In case of eye contact, completely flush eye(s) with cool water and seek medical attention.